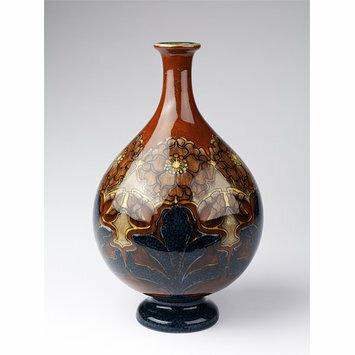 Vase of earthenware painted with colours. Bulbous with a short narrow neck and spreading foot. Painted on a brown ground with roses and leaves. Remains of a printed and handwritten paper label. 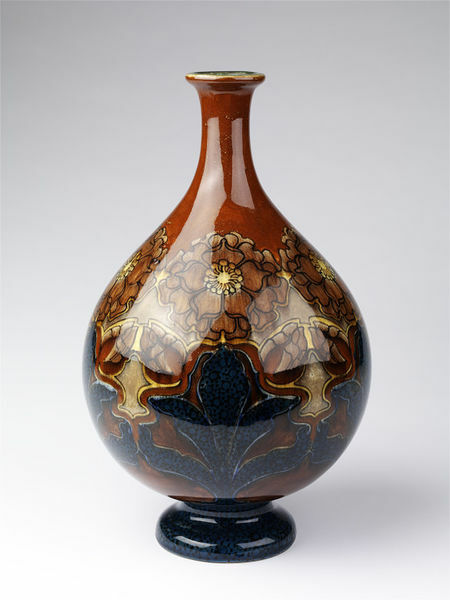 Vase of painted stoneware made by Haagsche Plateelbakkerij Rozenburg, The Hague, dated 1893. Marks: 'Rozenburg den Haag 219' a stork, and 'K' within an oval, painted 'W476E' incised remains of a paper label 'Rozenburg Holland M...', printed and handwritten. Possibly 1893. 'K' is the date code for 1893.